The next two weeks are very busy with New Links, the distance learning program of Cooperating School Districts. Take a look at what we have coming up! In our schools, classes will be connecting for multiple sessions with content providers like Roper Mountain Science Center for Super Cool Science; Berrien RESA for MysteryQuest; Lee Richardson Zoo for Ready, Set, Recycle; Muskingum Valley ESC for Egg to Butterfly; and with the Hoover Presidential Library for Laura Ingalls Wilder. Live, from Cooperating School Districts’ distance learning room, we have content providers connecting to schools outside of the state. 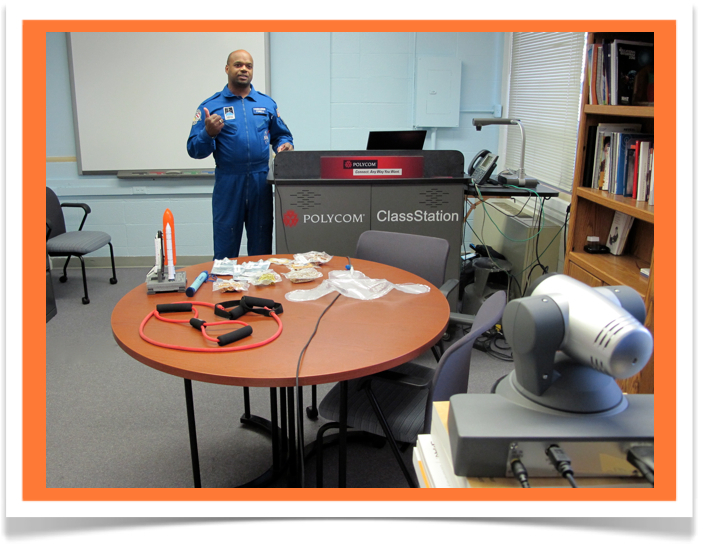 Science educator Robert Powell (in photograph) from the Challenger Learning Center-St. Louis will present to schools in Arizona and New York and author Barri Bumgarner conducts a videoconference with a high school in Tennessee tomorrow. Author Amy Sklansky will also be back to connect to Independence Elementary in the Francis Howell School District. Are you interested in videoconferencing and distance learning, but not really sure what it is about? The Virtual Learning Center is offering a class Wednesday, June 8th on distance learning. New Links for Your Classroom with Videoconferencing & Skype is a one day class held at CSD’s tele; to register, click here.